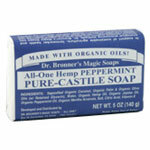 All the core soap and essential oils for Dr. Bronner's certified Organic Bar Soaps are sourced organically. The soaps are lighter in color as the rosemary no longer darkens them, but are just as concentrated as the liquid soaps. Dr. Bronner's has replaced fatty acid with organic olive, hemp and jojoba oils. All varieties as listed. Made With Organic Oils! Almond:Saponified Organic Coconut, Organic Palm & Organic Olive Oils (w/Retained Glycerin), Water, Organic Hemp Oil, Organic Jojoba Oil, Salt, Citric Acid, Vitamin E.
Unscented Baby-Mild:Saponified Organic Coconut, Organic Palm & Organic Olive Oils (w/Retained Glycerin), Water, Organic Hemp Oil, Organic Jojoba Oil, Salt, Citric Acid, Vitamin E.
Eucalyptus:Saponified Organic Coconut, Organic Palm & Organic Olive Oils (w/Retained Glycerin), Water, Organic Hemp Oil, Organic Jojoba Oil, Salt, Citric Acid, Vitamin E.
Citrus Orange:Saponified Organic Coconut, Organic Palm & Organic Olive Oils (with retained Glycerin), Water, Organic Hemp Oil, Organic Jojoba Oil, Organic Lemon Oil, Salt, Citric Acid, Vitamin E.
Lavender:Saponified Organic Coconut, Organic Palm & Organic Olive Oils (with retained Glycerin), Water, Organic Hemp Oil, Organic Jojoba Oil, Organic Lavandin Oil, Organic Lavender Oil, Salt, Citric Acid, Vitamin E.
Peppermint:Saponified Organic Coconut, Organic Palm & Organic Olive Oils (with retained Glycerin), Water, Organic Hemp Oil, Organic Jojoba Oil, Organic Peppermint Oil, Organic Mentha Arvensis, Salt, Citric Acid, Vitamin E.
Tea Tree:Saponified Organic Coconut, Organic Palm & Organic Olive Oils (w/Retained Glycerin), Water, Organic Hemp Oil, Organic Jojoba Oil, Salt, Citric Acid, Vitamin E.
Rose:Saponified Organic Coconut, Organic Palm & Organic Olive Oils (with retained Glycerin), Water, Organic Hemp Oil, Organic Jojoba Oil, Natural Rose Fragrance, Salt, Citric Acid, Vitamin E.